Manitoba’s tall grass prairie once spanned over 6,000 square-kilometers but with agriculture and urbanization, that number has been reduced to less than 15 square-kilometers. Similarly, since the arrival of the first settlers in Canada, up to 70 per cent of the wetlands that once served as storage for excess rain and snow melt in populated areas has been lost. This loss of natural water storage contributes to spring flooding in Manitoba. The constructed wetlands and native plantings in Sage Creek, created in partnership with Native Plant Solutions, help to protect the environment for present and future generations. Storm water management is a crucial component of water conservation, watershed health and environmental stewardship. Polluted surface run-off does not pass through a water treatment facility. Rather, when rain water flows and pools, it collects sediment and contaminants while eventually making its way into the groundwater, lakes, rivers and streams within the Lake Winnipeg watershed. Some common pollutants collected by surface run-off include fertilizer from lawns, fuel from vehicles, detergents, and salt from winter road de-icing. An increase in algal blooms in Lake Winnipeg in recent years has been linked to excess nutrients from both urban and rural sources that enter the lake as run-off. To combat excess water run-off, bio-retention systems have been incorporated into Sage Creek. 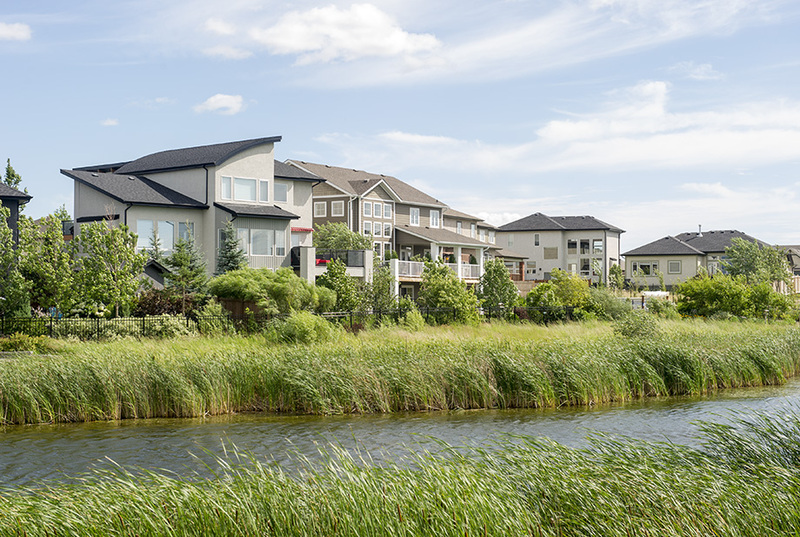 Designed by Native Plant Solutions in conjunction with Qualico Communities’ engineering consultants, these bio-retention systems are constructed either as wetlands or shallow low-lying vegetated areas with moisture-tolerant plants. These plants are native to Manitoba and provide greater benefits than non-native species because they have evolved to thrive in our specific climate and terrain. Many native species have developed longer root systems to reach deeper ground water in our hot summers and to protect themselves during our harsh winters. An example of this is the Big Bluestem, a type of native grass with roots that grow up to five metres in length! By lining the edges of bio-retention areas with native grasses and plants, the flow of storm water slows as it runs through the roots and is absorbed by the plants. These extensive root systems filter excess nutrients such as nitrogen and phosphorous before they reach our rivers and lakes. Once these bio-retention systems are established, Native Plant Solutions does numerous inspections each year to ensure that they stay healthy. These areas are then turned over to the City of Winnipeg for regular maintenance. However, during this process Native Plant Solutions continues to work closely with the City to deliver assessments and to ensure that the program is successful. Erosion prevention is another strength of native grasses. Their large root systems help hold soil in place and prevent erosion from still water, storm water run-off and prairie winds. Over time, a community can lose hundreds of square-feet of land to erosion but by planting these species, we can slow that process. As Manitoba’s native plants and grasses have evolved, they have developed abilities to ward-off unfriendly insects and weeds, therefore they require less herbicide and pesticides to stay healthy. Their roots dig deep into the ground allowing them to access water and nutrients found below the root systems of their neighbouring plants which prevents weeds from stealing their resources. Many public greenspaces can be challenging and costly to maintain. By planting native grasses in Sage Creek, we reduce the long-term cost of care in these areas since they require minimal maintenance. Their upkeep entails a controlled burn by the City of Winnipeg every five years. This helps to control weeds and allows the grasses to regenerate and different species of plants to bloom. The native plants and grasses used in Sage Creek’s bio-retention systems produce homes for a variety prairie wildlife. The vegetation provides safety for smaller creatures, materials for birds to build nests and hunting grounds for birds of prey. Some animals you may see in these areas include rabbits, foxes and dozens of species of song birds. Unlike traditional retention ponds, our naturalized wetlands and buffer areas deter critters such as gophers, prairie dogs and geese who prefer open areas with short grass. Sage Creek is designed to promote pedestrian connectivity among homes, amenities, parks and other destinations. This gives residents the opportunity to walk or cycle around the community rather than take the car – which is healthier for the body and the environment! Trails in Sage Creek are constructed with crushed limestone. Unlike traditional surfacing materials like concrete or asphalt, crushed limestone is semi-permeable meaning it allows for better water drainage which prevents water from pooling and reduces run-off erosion. Traditional surfacing materials like concrete or asphalt, are impervious which means that they don’t allow storm water to drain. This causes water to pool creating conditions where mosquitoes can breed. It also increases water run-off which leads to erosion. Traditional surfacing materials also involve more resources to install, contain petro-carbons and require greater levels of maintenance and replacement. Not only do crushed limestone trails provide shock absorption for running and walking but they also reflect less heat, making it cooler for pets to walk on during Manitoba’s hot summer months. Additionally, crushed limestone trails are easier and less expensive to maintain and repair. In unison, Qualico Communities uses these practices in Sage Creek to help protect habitats and to create a more sustainable neighbourhood. A reduction in greenhouse gases, erosion and fertilizers lessens pollution, which in turn helps to clean the water entering our rivers and lakes.